"It was too far to make out the banners clearly, but even through the drifting fog she could see that they were white, with a dark smudge in their center that could only be the direwolf of Stark, grey upon its icy field. When she saw it with her own eyes, Catelyn reined up her horse and bowed her head in thanks." I instead chose to recreate the direwolf shape. 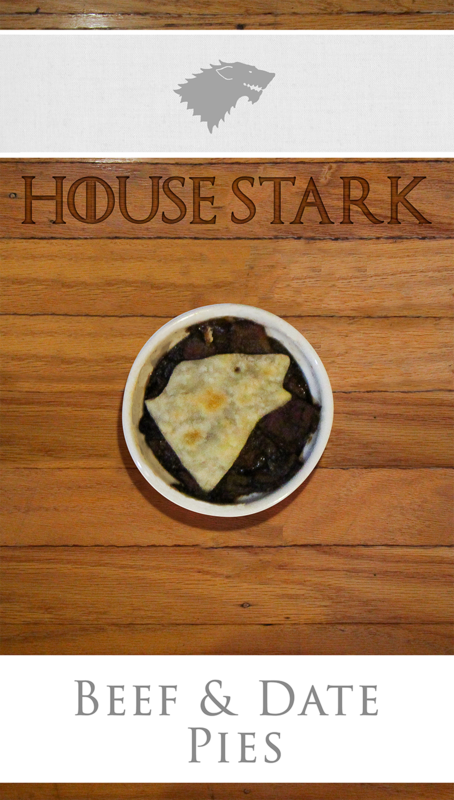 I ordered a Stark cookie cutter from Etsy however USPS lost it and it didn't arrive on time! As a back-up plan, I ordered a full-sized wolf (well, coyote) cookie cutter from Amazon and used just the head portion to cut the dough. Because wolves are carnivores, it seemed appropriate to make the Stark course a meat course, so I used my cookie cutter to shape a pie crust for a meat pie. I'd previously made Inn At The Crossroads' Beef and Bacon pie and liked it; the dried fruits are an unusual touch that tastes medieval. I can imagine much of the fare at Winterfell incorporating preserved fruits and vegetables due to its short growing season, so it seemed like a great starting point for a recipe. I made a few changes to the original medieval-inspired recipe. For example, soy sauce is an excellent way to add depth to a recipe but wouldn't have been available to medieval Britons. The pie filling can easily be made ahead of time. Store in the fridge for a few days, or freeze for a couple of weeks (thaw overnight in the fridge!). Once topped with pastry, the ramekins can be covered in plastic wrap and stored in the fridge until you are ready to cook them. If you do so, add 2-3 minutes to the cooking time. Heat a skillet over medium heat. Coat the bottom of the skillet with the vegetable oil to prevent the bacon from sticking. Cook the diced bacon until the fat has rendered and the pieces begin to brown. Remove the bacon bits and reserve on a plate. Pour off all but 1 tbsp of the oil, saving the rest for when you need a "secret ingredient" for something. Brown half the beef cubes in the reserved bacon fat and transfer to the bacon plate. Brown the remaining beef, and add to the plate. Turn down the heat and brown the onions in the pan, adding in extra bacon grease if the pan seems dry. Cook until the onions are quite soft and sweet. Sprinkle the flour over the remaining fat in the pan. Stir quickly until the roux begins to bubble slightly. Deglaze with the red wine. Return the beef and bacon to the skillet. Stir in the dried fruits, vinegar, pepper, beef broth and soy sauce. Simmer over low heat until the juices begin to thicken. Taste for seasoning, adding salt as desired. Preheat the oven to 375°F and move the wire rack to the top slot of the oven. Spoon 3-4 tbsp of the pie filling into each 3-inch ramekin. Dust a working station with flour and roll out the pie dough to 1/4 inch. Dip the cookie cutter into flour, then press onto the dough. (If you are using a full-wolf cookie cutter, let the wolf body hang over the edge of the dough so that you imprint only the head.) With a small spatula, carefully place the pastry wolf head onto a ramekin. Use a skewer to prick the pie crust to create an eye. Repeat until all the ramekins have been marked with the Stark sigil. Arrange the ramekins on a large baking sheet to make them easier to handle. Bake for 10 minutes or until the filling is heated through and the crust is golden brown.